I am loving her work. Actually I am loving the thought of having such talent while working in the space of hers. I think it's brave of her to have a rug in her studio- I'd be afraid that I'd spill paint all over it! I love her abstracts. Beautiful post Courtney. 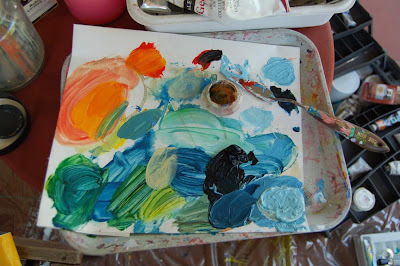 I love the artists' palettes series! Inspiration Boards might be an interesting topic after the artist's palettes! Thanks Reviska for prompting me! This series is so fun, Courtney. I love Vicky's work, so it's nice to be able to see more on her and get a peek inside her studio. I admire her ability to sit up like that and paint - my neck is hurting for her. Thank you everyone for the comments! I'm just excited to be part of this fun string of posts. Anne, my neck does end up hurting most of the time, now I know why. That awkward position helps me keep a steady hand when needed! 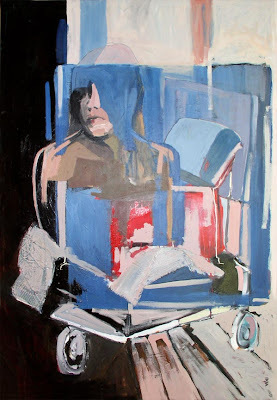 Thanks Courtney for including me in your palette series, they are so much fun to read! I liked your blog its nice. Keep it up good work.... Congratulation!!! Good posting its nice blog, i more like this blog, Thanks!!!! Great post. I too enjoy seeing the great spaces of other artists studio's. Emotion fuels creativity and inspires others. We are visual creatures of habit, with the need to "see" everything. Thanks for sharing! 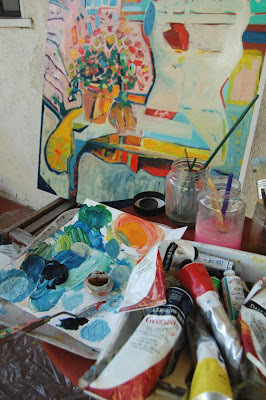 I am really enjoying getting glimpses into these wonderful artists' studio/work spaces and art palettes! So interesting! Oh wow! Her work is beautiful. This is a great series. I love getting to peek at artists' workspaces. Really brilliant. I so want to learn to paint....I love her desk and painting area. Great inspiration! Her work is so interesting! 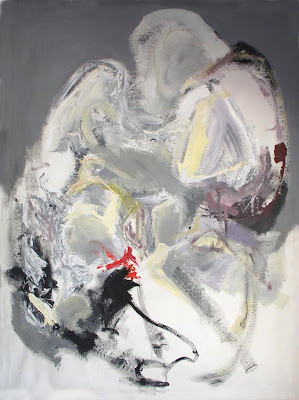 l love the combination of figurative and abstraction. Great Post!